Why Does ISIS Kill Muslims? Originally published under the title "The Jihad on Sufism." 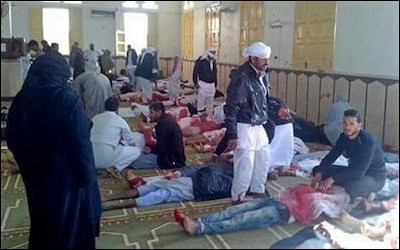 At least 305 civilians were killed on November 24 when ISIS bombed a Sufi mosque in the Egyptian Sinai village of al-Rawdah and opened fire on the panicked crowd. On Friday, November 24, some 30 gunmen carrying the Islamic State flag bombed and stormed a Sufi mosque in Egypt's North Sinai, about 125 miles northeast of Cairo. They managed to massacre at least 305 people, 27 of whom were children. "The scene was horrific," said Ibrahim Sheteewi, an eyewitness. "The bodies were scattered on the ground outside the mosque. I hope God punishes them for this." Not only is this considered the deadliest terrorist attack in Egypt, but one of the strangest as well. As the NYT explains, "The scale and ruthlessness of the assault, in an area racked by an Islamist insurgency, sent shock waves across the nation — not just for the number of deaths but also for the choice of target. Attacks on mosques are rare in Egypt, where the Islamic State has targeted Coptic Christian churches and pilgrims but avoided Muslim places of worship." Indeed, whereas the bombing and burning of churches and the slaughter of Christians in Egypt at the hands of, not just ISIS, but Muslim mobs and murderers, is hardly an uncommon occurrence in Egypt, attacks on mosques in the name of jihad naturally are. ISIS does not view its Muslim victims as true Muslims. One Muslim cleric from the region who requested anonymity best voiced the general view: "I can't believe they attacked a mosque." In the West, this selfsame shock of Muslim on Muslim terrorism is used to support the politically correct mantra that terror groups such as the Islamic State truly have nothing to do with Islam—otherwise they would not bomb mosques and kill fellow worshippers of Allah. Because the attack occurred late Friday—and, as of this writing, it is only Sunday, meaning still the weekend—capitalizing on this tragedy as a way to distance Islam from terrorism has not yet begun in the West; but, if precedent is any indicator, it soon will. For example, last year during the closing days of Ramadan, a spate of terror attacks occurred in Bangladesh, Iraq, and Saudi Arabia—all Muslim nations; these were followed by a media outpouring of "told you Islam wasn't responsible for terrorism," or, to quote Bangladesh's Prime Minister Sheikh Hasina, "Anyone who believes in religion cannot do such act. They [Islamic State] do not have any religion, their only religion is terrorism." Speaking after the San Bernardino terror attack that left 14 dead, Barrack Obama agreed: "ISIL does not speak for Islam. They are thugs and killers, part of a cult of death... Moreover, the vast majority of terrorist victims around the world are Muslim." After the November 2015 Paris terrorist attacks, which left 130 people dead, the UK's Independent published an article titled, "Paris attacks: Isis responsible for more Muslim deaths than western victims." And the Daily Beast argued that, "Before the Paris horror, ISIS was killing Muslims on a daily basis. We Muslims despise these crazy people more than anyone else does.... But the number one victim of this barbaric terror group is Muslims. That's undisputed." Along with distancing Islam from violence—real Muslims are not supposed to kill other Muslims in the name of jihad—this argument further clouds the issue of who is the true victim of Islamic terrorism: Why talk about the Muslim slaughter of non-Muslims—whether Western people, Israelis, or Christian minorities under Islam—when it is Muslims who are the primary victims most deserving of sympathy? Killing 'fellow Muslims' doesn't make ISIS un-Islamic. The problem with this argument, however, is that the Islamic State does not view its victims as Muslims. Indeed, mainstream Sunni Islam—the world's dominant strand of Islam which 90 percent of the world's Muslims, including ISIS, adhere to—views all non-Sunnis as false Muslims; at best, they are heretics who need to submit to the "true Islam." This is largely how Sunnis view Shias and vice versa—hence their perennial war. While Western talking heads tend to lump them all together as "Muslims"—thus reaching the erroneous conclusion that ISIS is un-Islamic because it kills "fellow Muslims"—each group views the other as enemies. A saying attributed to the Muslim prophet Muhammad even validates this: "This umma [nation] of mine will split into seventy-three sects; one will be in paradise and seventy-two will be in hell." When asked which sect was the true one, the prophet replied, "al–jama'a," that is, the group which most literally follows the example or "sunna" of Muhammad. Overall, then, when Sunni jihadis slaughter Shias—or Sufis, Druze, and Baha'i—they do so under the exact same logic as when they slaughter Christian minorities, or European, American, and Israeli citizens: all are infidels who must either embrace the true faith, be subjugated, or die. 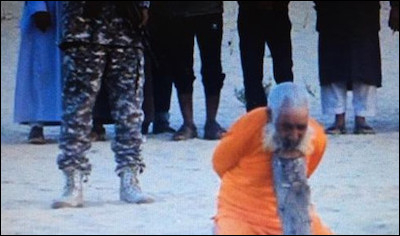 Ansar Bayt al-Maqdis, an ISIS-affiliated jihadi group in Egypt, beheaded Sufi cleric Sulayman Abu Hiraz on charges of sorcery in November 2016. Concerning Sufis in particular, last January an ISIS commander situated in Sinai "outlined the group's hatred for Sufis and their practices, including the veneration of tombs, the sacrificial slaughter of animals and what he termed 'sorcery and soothsaying.'" The Islamic State has further referred to Sufism as a "disease" that needs to be "eradicated." Accordingly, a year ago, ISIS beheaded Sulayman Abu Hiraz, a Sufi cleric reportedly over 100 years old, on the charge of sorcery. The argument that ISIS and other jihadi organizations kill fellow Muslims proves nothing. Muslims have been slaughtering Muslims on the accusation that they are "not Islamic enough" or the wrong "kinds" of Muslims from the start: So what can the open non-Muslim—such as the Western infidel—expect? Indeed, if anything, that ISIS kills other "Muslims" only further validates the supremacist and intolerant aspects of Sunnism, which is hardly limited to ISIS. Just look to our good "friend and ally," Saudi Arabia, the official religion of which is Sunni Islam, and witness the subhuman treatment Shia minorities experience. In the end, it's just jihad and more jihad, for all and sundry. Raymond Ibrahim is a Judith Friedman Rosen Fellow at the Middle East Forum.